He gave everything, including his name. He died on a muddy battlefield in France more than 80 years ago and because of that we know very little about him. He is Canada’s Unknown Soldier and the nation welcomed him home with tremendous dignity last May and laid him to rest in a tomb in front of the National War Memorial. It is a powerful story, but it does not end with the funeral; it endures so long as we–and generations to come–remember his symbolic sacrifice and pause long enough every day to think about the hope and the fear associated with preserving the kind of peace and freedom he fought and died for. Hope comes when we think about the way in which The Royal Canadian Legion and other groups joined forces to bring him home and the way in which thousands of people have cared enough to remember his sacrifice. Fear comes when we think about the terrible set of circumstances that led to his death and to the deaths of thousands like him in a war that was supposed to end all wars. These are just some of the thoughts and feelings people may have when they visit his beautiful bronze and granite tomb, especially this time of year when summer gives way to fall and when the leaves cut loose from the linden trees along Elgin Street and go scurrying across the stone promenade surrounding his gravesite. In the weeks ahead, some of the leaves may brush against his tomb and come to rest among the bouquets of flowers and tiny crosses placed there by people who have come to read the short inscription, The Unknown Soldier, Le Soldat Inconnu, and ponder who he was. The soldier’s original stone marker at Plot 8, Row E, Grave 7 in Cabaret-Rouge British Cemetery, France, told us that he is known unto God. If this is true, then Canada’s Unknown Soldier would know that his journey home last May was part of a combined and enduring pledge to uphold the cause of remembrance, a sacred commitment that has been promoted by The Royal Canadian Legion throughout its 75-year history. The Unknown Soldier would know about the dignified ceremony that took place May 25 at the Vimy Memorial in France where his remains were handed over to the Canadian government by the Commonwealth War Graves Commission. He would know about the thousands of Canadians of all ages who prayed and cried for him while his flag-draped casket lay in state under constant vigil for three days in the Hall of Honour on Parliament Hill. He would know how incredibly appreciative the crowd was as he was carried on a 100-year-old, horse-drawn gun carriage from the Parliament Buildings through downtown streets to the war memorial. He would know how Legionnaires gently covered the top of his silver maple casket with handfuls of soil brought in from Canada’s 10 provinces and three territories to be mixed with soil collected from the soldier’s grave in France. He would know how he was laid to rest with full military honours at 2 p.m., Sunday, May 28. More than 20,000 people, including some 1,200 veterans, attended the ceremony. Millions of others watched on television. What they witnessed was one of the most solemn and comprehensive military ceremonies Canada has ever seen. The Governor General said it is a frightening thing for human beings to think they could die and that no one would know to mark their grave, to say where they had come from, to say when they had been born and when exactly they had died. Prime Minister Jean Chrétien spoke next. He said Canada greatly remembers the sacrifices of the past and he declared that the Unknown Soldier is “Canada’s lost son no more.” He then went on to thank the Legion for its leadership in returning the soldier to Canada, an accomplishment that has become a crucial part of Canadian military history and a vital part of our national identity. The efforts that culminated in Canada’s Tomb of the Unknown Soldier began to take shape in early 1996 when some of the Legion’s senior leaders visited South Africa to attend a conference of the British Commonwealth Ex-Services League. While in Cape Town, Dominion Secretary Duane Daly made arrangements for the two attending members of the RCL’s executive–then-dominion President Hugh Greene and then-first vice Joe Kobolak–to visit the graves of Canadian soldiers killed in the Boer War. While accompanying the two dominion reps to the gravesites, the dominion secretary proposed that a Canadian Tomb of the Unknown Soldier would be a defining project for the Legion as it heads into the next millennium. He also saw it as a way to mark the start of the Legion’s 75th anniversary and as a way to promote the organization’s commitment to veterans and remembrance. The timing was excellent because interest in wartime contributions and accomplishments was exceptionally high thanks to the huge celebrations marking the 50th anniversary of the end of WW II. The idea was approved by the Legion’s executive and soon the dominion secretary opened discussions with reps from other veterans groups. He learned that the idea had been discussed before, but it was clear that not enough work had been done to establish a consensus that would warrant the efforts required to implement such a huge project. A consensus was reached and then all the hard work began. There was a vast number of details to be worked out and many jobs to assign. In the early stages of the planning, the Legion considered bringing home the remains of an unknown soldier killed in the Boer War. The idea made sense because 1999 marked the 100th anniversary of the start of that war. However, during a meeting in March 1998, it was Major-General Roméo Dallaire–representing the Department of National Defence–who said the soldier’s remains should come from the area around Vimy Ridge because that was where–in April 1917–all four infantry divisions of the Canadian Corps fought together for the first time. The ridge was well-fortified and of vital importance to the German defence system, but the Canadians attacked it at dawn on Easter Monday, April 9. Almost 3,600 Canadians were killed and approximately 7,000 more were wounded in that vicious three-day battle, but the Canadians succeeded where all previous Allied attempts to take it had failed. This is why Vimy Ridge is considered by many to be the birthplace of our nation. And so it was agreed that the Unknown Soldier’s remains should come from one of the war cemeteries in the vicinity of that historic battle. With that in mind, the Canadian government asked the Commonwealth War Graves Commission to select one grave from among 1,603 unknown Canadians located in the area. It is a sad fact that many of the military cemeteries in that part of France contain the remains of thousands of soldiers killed between the fall of 1916 and the spring 1918. Therefore, no one knows whether Canada’s Unknown Soldier died at Vimy Ridge or in another battle. Throughout 1998 and ‘99, support for the Legion initiative grew and a working group was established, chaired by the dominion secretary. 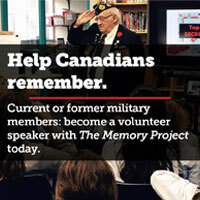 Around the same time the Legion hired a special projects manager, retired air force general Larry Doshen, to manage the Legion’s millennium projects. Between April 1998 and March 2000 the working group met nine times to define responsibilities relating to everything from ceremonial procedures to public relations. The Legion continued in its role as project director/coordinator and retained responsibility for the interment ceremony at the National War Memorial. It applied for and received a millennium grant from the Canada Millennium Partnership Program and received funding from DND and the Department of Canadian Heritage to produce a documentary film. Veterans Affairs Canada became the lead government department and among other things was responsible for co-ordinating the handover of the Unknown Soldier’s remains at the Vimy Memorial. The Department of National Defence was responsible for transporting and securing the remains, including the ceremonial aspects of the lying-in-state, the intricate ceremonial funeral procession and the burial ceremony at the war memorial. Public Works and Government Services was responsible for constructing the tomb and making modifications to the war memorial, and the Royal Canadian Mounted Police took on several duties, including the job of providing the horse- drawn gun carriage. It was a lot of hard work, but the dream became a reality. After he spoke, Kerr asked Veterans Affairs Minister George Baker to accept responsibility for the “care and custody” of Canada’s Unknown Soldier. The lasting, emotional impact of war was also seen the day before the handover ceremony. In particular, it was noticed on the faces of Darlene Peterson and Linda Marfleet, both from Alberta and both grandnieces of a WW I soldier whose remains were found Jan. 2 by British tourists out for a walk in a farmer’s field near Beaumont Hamel. Peterson and Marfleet wiped away tears as the remains of Private David John Carlson of Mannville, Alta., were laid to rest with full military honours at Pozieres British War Cemetery. Carlson served with the 8th Battalion, Canadian Expeditionary Force, and he was 19 when he was killed in September 1916. Also laid to rest were the remains of an Unknown Australian soldier killed in the same war. “Here we have a situation where a young man has been missing in action for some 83 years and finally by accident his remains are found…and he was finally put to rest,” said Baker This, he noted, highlights the reality that there are 27,607 Canadian soldiers, sailors and airmen with no known grave. You close your eyes and imagine a face appearing in the darkness above the tomb. The face may appear solid and grey–like granite–or it may be translucent. Either way, the exact features are hard to distinguish. When you open your eyes you may be among strangers who have also come out to spend a few moments at the Tomb of the Unknown Soldier. It is a beautiful tomb and many people are impressed by how it complements the National War Memorial located a few metres away. Situated on the upper stone plaza or promenade on the south side of the war memorial, the sarcophagus consists of three tiers of granite inscribed simply: The Unknown Soldier–Le Soldat Inconnu. 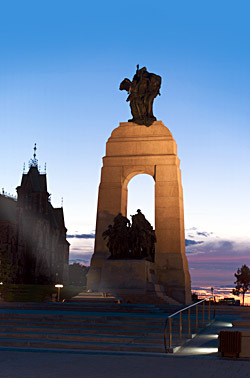 The basic design, which replicates the stone altar at the base of the huge Vimy Memorial in France, was developed by the federal government’s official sculptor Maurice Joanisse. It measures 2.3 metres wide, 3.75 metres long and .87 metres high. It weighs roughly 10,000 kilograms and contains a silver maple casket with the remains of a Canadian who died in WW I. The lid of the sarcophagus features a helmet of the type worn by Canadians in WW I, WW II and the Korean War. It also features a battle-scarred medieval sword, and branches of maple and laurel leaves, but unlike the stone elements on the Vimy altar, these details are made of bronze that was cast by Steven Harman at the Harman Foundry in Roberts Creek, B.C. Harman is the son of Jack Harman, the sculptor who crafted the Queen’s equestrian statue on Parliament Hill and who was part of the creative force behind the national peacekeeping monument also within sight of the Parliament Buildings. The four corners of the tomb are anchored with bronze extensions containing replicas of the Memorial Cross or Silver Cross on three corners and a poppy on the fourth. The crosses are slightly different in that they bear the royal ciphers of King George V, King George VI and Queen Elizabeth II, the successive monarchs since the cross’s inception in 1919. The individual crosses denote past and present sacrifice and mourning. The single poppy represents those who may fall in future conflicts. Hired under contract by Public Works and Government Services Canada, Mary-Ann Liu of Mission, B.C., completed the tomb’s bronze detail. She was selected for the job last December after she and half a dozen other artists submitted proposals on how best to meet the criteria for the tomb’s conceptual design. The committee that selected her proposal included representatives from The Royal Canadian Legion, Veterans Affairs Canada and National Defence. The tomb’s dark Caledonia granite was supplied by Granite Appalaches of Quebec and came from Rivière-à-Pierre, approximately 75 kilometres northwest of Quebec City. Days before the May 28th funeral service, Joanisse, Liu and Harman were busy in a works garage matching the bronze to the stone. Joanisse said he was proud to be working on such an important project. The design of the tomb denotes a passage of time–a transition from granite into bronze. “We have a sand-blasted granite finish going into a rough finish and then there is a transformation of the leaves from a granite leaf with a rough texture into a bronze leaf with the same texture, moving into a smoother texture and then into a leaf texture,” said Liu. The Tomb of the Unknown Soldier is a visible reminder of the young soldiers, sailors and airmen who died for Canada in pursuit of peace and freedom. And like many who served, our Unknown Soldier is nameless, but from his resting place he has a face. It is the face of sacrifice. Yesterday’s, today’s and tomorrow’s. The following is an edited text of the eulogy delivered by Governor General Adrienne Clarkson on Sunday, May 28. Wars are as old as history. Over 2000 years ago, Herodotus wrote: “In peace, sons bury their fathers; in war, fathers bury their sons.” Today, we are gathered together as one, to bury someone’s son. The only certainty about him is that he was young. If death is a debt we all must pay, he paid before he owed it. We do not know whose son he was. We do not know his name. We do not know if he was a MacPherson or a Chartrand. He could have been a Kaminski or a Swiftarrow. We do not know if he was a father himself. We do not know if his mother or wife received that telegram with the words “Missing In Action” typed with electrifying clarity on the anonymous piece of paper. We do not know whether he had begun to live his life as a truck driver or a scientist, a miner, a teacher, a farmer or a student. We do not know where he came from. Was it the Prairies whose rolling sinuous curves recall a certain kind of eternity? Was he someone who loved our lakes and knew them from a canoe? Was he someone who saw the whales at the mouth of the Saguenay? Was he someone who hiked in the Rockies or went sailing in the Atlantic or in the Gulf Islands? Did he have brown eyes? Did he know what it was to love someone and be loved back? Was he a father who had not seen his child? Did he love hockey? Did he play defence? Did he play football? Could he kick a field goal? Did he like to fix cars? Did he dream of owning a Buick? Did he think nobody understood him? Did he just want to go out and have a good time with the boys? We will never know the answers to these questions. We will never know him. But we come today to do him honour as someone who could have been all these things and now is no more. We who are left have questions that only he could answer. And we, by this act today, are admitting with terrible finality that we will never know those answers. We cannot know him. And no honour we do him can give him the future that was destroyed when he was killed. Whatever life he could have led, whatever choices he could have made are all shattered. They are over. We are honouring that unacceptable thing–a life stopped by doing one’s duty. The end of a future, the death of dreams. Yet we give thanks to those who were willing to sacrifice themselves and who gave their youth and their future so that we could live in peace. With their lives they ransomed our future. It is a frightening thing for human beings to think that we could die and that no one would know to mark our grave, to say where we had come from, to say when we had been born and when exactly we died. In honouring this unknown soldier today, through this funeral and this burial, we are embracing the fact of the anonymity and saying that because we do not know him and we do not know what he could have become, he has become more than one body, more than one grave. He is an ideal. He is a symbol of all sacrifice. He is every soldier in all our wars. Our veterans who are here with us today, know what it is to have been in battle and to have seen their friends cut down in their youth. That is why remembrance is so necessary and yet so difficult. It is necessary because we must not forget and it is difficult because the pain is never forgotten. And the sense of loss, what this soldier’s family must have felt, is captured by Jacques Brault, the Quebec poet who lost his brother in the Second World War, and wrote Suite Fraternelle. You open the road for us. Whatever dreams we have, they were shared in some measure by this man who is only unknown by name but who is known in the hearts of Canadians by the virtues that we respect–selflessness, honour, courage and commitment. The wars fought by Canadians in the 20th century were not fought for the purpose of uniting Canada, but the country that emerged was forged in the smithy of sacrifice. We will not forget that. This unknown soldier was not able to live out his allotted span of life to contribute to his country. But in giving himself totally through duty, commitment, love and honour he has become part of us forever. As we are part of him.